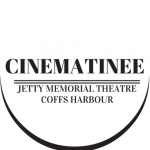 Cinematinee is a program of world cinema, art house and independent films that are screened fortnightly on Thursdays at Jetty Memorial Theatre. For program information, visit the box office section of www.jettytheatre.com. To book in, the theatre can be reached on 02 6652 8088.